Matt Fothergill is one of Britain’s best leatherworkers. The quality of the leather he uses is a pleasure to touch and his stitching and styling are faultless. He studied saddlery, harness making, fashion accessory design and construction at Cordwainers College in London. He now specialises in commissions and bespoke work as well as volume production. 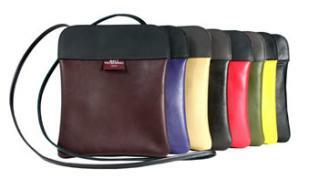 At Sladers Yard we stock handbags, wallets and purses in all colours. We are delighted to arrange for Matt to make larger bags and commissions.